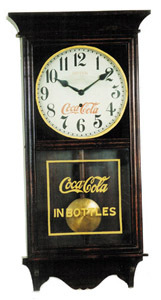 Original Coca Cola clock in a Waterbury Clock Co. "No. 43-22" case, or called "Varsity", by Waterbury sometimes, as stated on the old label on the back. This clock is not pictured in any of Waterbury's catalogs. After examining thoroughly it is evident the cases were made for Coca Cola. 8 day nickel movement marked only "20", and "84". Movement is A shaped, and running. Top Coca Cola dial is original, bottom glass appears old but could be a replacement. Several clock "experts" have examined the glass, some say yes, some say not sure, nobody said no. The dial paper is marked "Made in Winsted Conn USA". 34 inch mahogany case, correct old pendulum. No extra holes for dial pan or movement.